Over $1.6 billions is flowing into new fitness startups, including ClassPass, which is about to open up access to luxurious retreats. Drumming workouts are catching fire, Club Insider talks PHIT, IHRSA champion Jim Worthington is slated to speak at the Motionsoft Technology Summit, and more fitness news. Peloton, ClassPass, Tiger Global Management are the top three startups that are raking in millions in venture funds, according to Crunchbase. But they’re not the only startups attracting the big bucks. From Aaptiv, which provides fitness training content at the touch of a button, to Zwift, a company that is working to develop a multiplayer video game aimed at runners and cyclists, investors are looking for unique ideas that bring convenience and entertainment to users. The top 10 most-funded companies have raised over $1.6 million collectively. Read about the top 10 most-funded startups. ClassPass keeps making news after announcing the launch of ClassPass Getaways, Elle reported in a recent article. The new feature allows the app’s users to put credits toward booking luxury wellness retreats in exotic destinations that offer unique fitness programming, treatments, and, thankfully, healthy food. ClassPass Founder Payal Kadakia said, "We’re thrilled to give members the opportunity to take a mini-escape from their day-to-day to try new things and explore unfamiliar places. It’s our hope that attendees will leave feeling energized and empowered to continue living life to their absolute fullest." The locations of the Getaways are being kept secret, but the first available retreat will roll out August 29. Read more about the new offering. Experts at Club Insider join the movement to get the PHIT Act passed, underlining the significance and impact the IHRSA-backed legislation could have on the industry. Club Insider talks with IHRSA Board Chair Jim Worthington, President and CEO Joe Moore, Executive Vice President of Public Policy Helen Durkin, Vice President of Communication and Leadership Engagement Meredith Poppler, and IHRSA Board Ex-Officio Derek Gallup on the importance of getting behind PHIT. These experts walk through how the passage of the bill would transform the industry—and the nation at large—for the better. “As an industry, let’s do everything we can to pass PHIT,” the article states. Legislation is now awaiting a Senate hearing after passing through the House in late July. Read more on what PHIT advocates have to say. 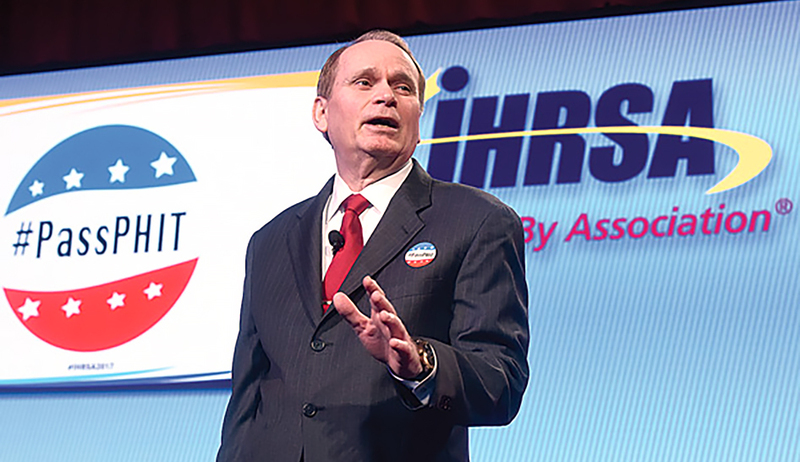 IHRSA CEO Joe Moore discusses PHIT. After falling behind other fitness apps, Google sought direction from the American Heart Association and the World Health Organization to redesign its Google Fit, Gizmodo reported. The tech behemoth will roll out its new app soon and unveil Move Minutes, which tracks movement, and Heart Points, which tracks heart rate. The data will then be compared and combined to accrue points, in a move that gamifies the app’s features. The app also offers a coaching function, goal setting, and can connect to other major fitness apps like Strava and MyFitnessPal. Read more about the new Google Fit. Pound Fitness, which uses weighted drumsticks and a sweet music playlist, is moving to a new Ohio location, just one of many opening up throughout the world, WDTN-TV reported. The workout focuses on movements that hit everything from “head to toe” and burns about 400 to 800 calories in one 30-45 minute class, an instructor said. Also an IHRSA member, Pound Fitness is designed for all fitness levels and incorporates cardio, strength training, Pilates, and HIIT techniques. Motionsoft announced that IHRSA Board Chair Jim Worthington will be the opening speaker at its annual Technology Summit, which is taking place October 3-5 in Washington, D.C. With over 40 years of experience in the health club realm, “Jim Worthington is one of the most experienced club operators in our industry,” said Al Noshirvani, chairman of Motionsoft. Over 200 experts in information technology, sales, and marketing are expected to converge at the event, now in its fifth year. It’s an event that “brings together really smart people from amazing companies to discuss the challenges and opportunities of technology in the fitness industry,” a press release stated. Read more about the Motionsoft Technology Summit.